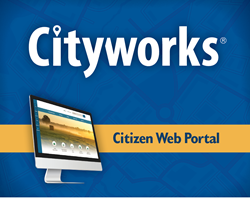 CitySourced and Cityworks partner to create a turnkey web portal for anyone to submit requests that connect directly into their Cityworks public asset management system. Working with CitySourced, we’re able to deliver user-friendly apps that empower citizens with the ability to interact directly with their local government. - Brian Haslam, President and CEO of Cityworks. CitySourced, the leading provider of mobile solutions for municipal governments recently announced that it has partnered with Cityworks to create a turnkey web portal allowing citizens to submit requests that flow directly into their Cityworks public asset management system. The feature is live and available, and can be seen on the city website of Longview, TX (http://www.longviewtexas.gov/2283/Report-an-Issue). “We certainly understand the importance of civic engagement and the value that can be achieved through new trends like crowdsourcing and mobile technology,” said Brian Haslam, President and CEO of Cityworks. “Working with CitySourced, we’re able to deliver user-friendly apps that empower citizens with the ability to interact directly with their local government. Moreover, we’ve combined to deliver this product with very little impact on the already strained budgets a local governments”. More information is available by contacting CitySourced. Since 1986, Azteca Systems Inc. has been providing Cityworks GIS-centric software to public agencies that own and care for infrastructure and property. Built exclusively on Esri’s ArcGIS technology, Cityworks® is a powerful, scalable, and affordable platform for asset management, permitting, licensing and more. Time-tested and proven technology, Cityworks is Empowering GIS® at more than 600 user sites around the world. Learn how Cityworks can empower your asset management team at http://www.cityworks.com. CitySourced is the world's leading enterprise mobile civic engagement platform. Using our solution, local government agencies can provide their citizens and residents simple and intuitive ways for them to quickly identify and report issues effecting their communities and quality of life. Issues such as potholes, graffiti, broken street lights, public safety, environmental and a host of other options can be submitted directly into the city's or county's work order management system. CitySourced empowers government to use technology to: 1) save time and money; 2) improve accountability to those they govern; and 3) provide a positive, collaborative platform for real action. A picture tells a thousand words and CitySourced makes it a snap.